This PDF encapsulates Cara's practise on storytelling and how to turn a trick into a piece of theatre. It encompasses setting, attitude, sound, crafting a tale, inspiration, hints, tips, getting the most from your verbal presentation and much much more. It also includes essays by professional storytellers revealing facets of their art. This is not a work for someone looking for tricks. It is however a work that will take your Magic to the next level. Isn't storytelling just for children? The Storyteller's experience by Vanessa Woolf. 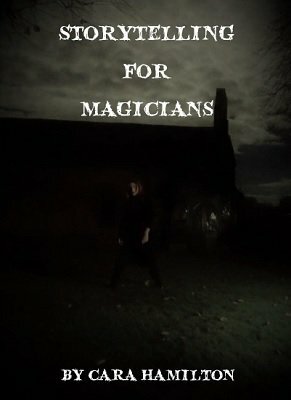 "Storytelling for Magicians" should be in the library of every serious student of magic. Every student that wants to elevate their magic from "tricks" into pieces of theatre that is. Not only does Cara explain the fundamentals of script writing and story telling, she also gives examples of both works in progress and finished pieces for the reader to see her process in action. Highly recommended! 1st edition 2018, 34 pages.